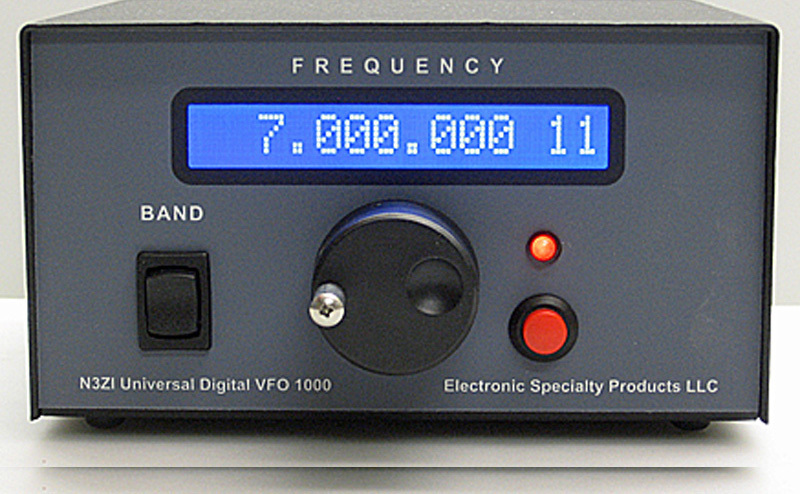 THE VFO 1000 UNIVERSAL REPLACES THE HF OSCILLATOR IN RECEIVERS THAT HAVE A SEPARATE OSCILLATOR TUBE. INCLUDING THE HRO SERIES, USE A SEPARATE OSCILLATOR TUBE. With the VFO 1000, tuning SSB is a snap. Most hams operate on even 1KHz frequencies. So using the 1KHz tuning step, SSB signals are received without careful tuning as required with analog tuning. Usually no tweaking is required. Use the 5KHz tuning step when tuning shortwave broadcast. All tuning is done using the VFO 1000. The receiver main tuning dial becomes the preselector. So simply tune the VFO 1000 to the frequency you want, and peak the signal using the receiver main tuning. Tuning steps available are 10Hz, 100Hz, 1KHz, and 5KHz. 10Hz and 100Hz for tuning SSB, and 1KHz and 5KHz for AM shortwave broadcast tuning, or just getting across the band faster. There are 30 tunable memories. In a sense there are 30 VFOs. As programmed from the factory, the 30 memories are used to step up or down in 1MHz steps, making getting from band to band faster. Programming can be user re-programmed to suit your needs. You can re-program it to step directly to the bands you use. Some memories can be used to store your favorite frequencies. Installation is by removing the oscillator tube, then using the included cable with a pin and ground, insert the pin in the tube socket, and clip the ground wire to the chassis. I will tell you what pin on your receiver. No soldering or modifications to the receiver are required. The power supply is included. Tell me what receiver you want to use it on and I will confirm that it is, or is not compatible with the VFO 1000.